See more FitnessCyberLog Personal Trainer Screen Shots by clicking on slice below. 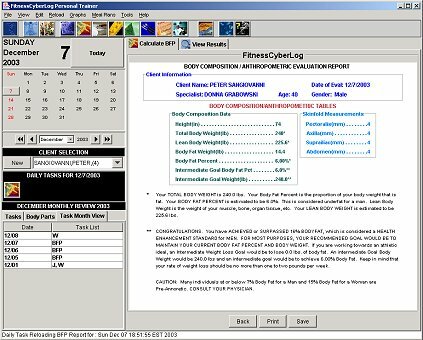 The Body Fat Report is another great tool from the FitnessCyberLog Personal Trainer. It will demonstrate to your clients the strides they are making in decreasing their Body Fat Percentage by following your Training Program. The corresponding graph to this data will also be a great visual effect for your clients. It will show their progress and help keep them motivated and coming back for more.